As a Persian cat breeder, we routinely have to make decisions about our cats. Whether it is to breed a cat or not, finding the right cat and pedigree to add something we lack in our breeding program, and a hundred other decisions that we make on a day-to-day basis. Recently, this point was more personal. Last year, one of my girls, MayMay, started cycling, and I had trouble keeping weight on her, so I retired her from showing in hopes of breeding her. I looked for the "perfect" mate for her and found a beautiful cream male named Maxx who is owned by a friend. We anxiously awaited MayMay's next heat cycle ... and, .... waited, and,.... waited. Three months went by, and MayMay had not cycled again (cats usually cycle every month). Scratching my head in confusion, I decided to let MayMay live with Maxx in the hopes he would bring her back into heat. Two months went by and nothing. I left MayMay out to run the house and figured she would cycle when she was ready. December arrives and MayMay finally comes into heat, so I put her with Maxx and crossed my fingers. A few weeks later I weighed MayMay, and she had picked up a little weight which I hoped was a sign she was pregnant. A few days later I weighed her again, and she had gained a bit more weight. I thought "she is pregnant." Then all of a sudden she stopped gaining weight and started to act like she was in heat again. So, I put her with Maxx again. The weekend of January 21, 2017, I was at a cat show with Rosie and when I got home on Monday John mentioned that MayMay had vomited a couple of times. I went to check out MayMay, and she seemed "off," just not acting like herself, but nothing I could put my finger on. On Tuesday afternoon, I saw that MayMay was off by herself and picked her up to thoroughly check her out. I smelled a putrid odor and quickly examined her and found that she had a vaginal discharge which was the source of the smell. MayMay had pyometra. Pyometra is an accumulation of pus within the uterus, which can develop because of the hormonal, anatomical, and physiological changes that occur after a cat has gone through a heat cycle but does not become pregnant. Bacteria then take advantage of the situation, resulting in a potentially fatal infection. Since it was too late to get her to the vet Tuesday evening, I called first thing Wednesday morning and got her in. I was then faced with the difficult decision of trying to clear up the infection with antibiotics or spay her and then put her on antibiotics. Due to her history of weird heat cycles and possible pregnancy (which she may have been in the process of aborting), I had to do what was in MayMay's best interest which was to spay her. I cried all the way home from the vet's office after leaving her there. About an hour later, my veterinarian called to say that evidently MayMay did get pregnant in December and there were three fetuses. However, MayMay was in the process of aborting them, and she had a severe infection. I asked the vet "did I make the correct decision?" I was told that it would have been very problematic with her aborting the fetuses and trying to treat her with antibiotics which would not have been effective because of losing the kittens. In other words, I would have been putting MayMay's life at risk by allowing her to continue as she was with just antibiotics. As I write this article, I am both relieved and heartsick. I am relieved because we caught this infection early and MayMay will be healthy again. 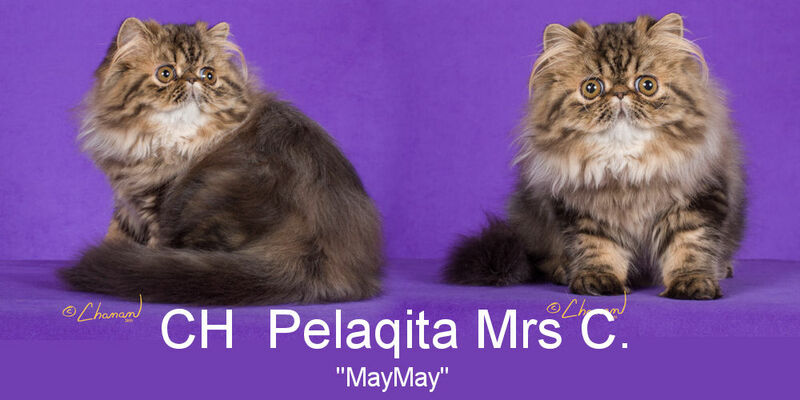 I am heartsick because of the loss of the kittens and the fact that I will never see any MayMay kittens. Decisions like this come hand-in-hand with being a cat breeder, and I always wonder if I am making the right decision for my cats. I feel that I made the right decision, but it was not an easy one to make and it will stay with me for quite some time. MayMay now resides in her forever home in New York state. A kitten buyer from a while ago contacted me about MayMay as he felt his parents would love her to bits. MayMay settled right in at her new home.